Where does the El Paso County Planning and Community Development Department have jurisdiction? Jurisdiction applies to the unincorporated portions of El Paso County (land that is not in an incorporated City or Town). The Planning and Community Development Department is not able to review projects that are in incorporated cities or towns because each of these have their own separate regulations. El Paso County is an “arm of the State” and thus mandated to uphold State Statutes. How do I know if I am in the County? A way to determine if a property/parcel is in unincorporated El Paso County, use the El Paso County Assessor Property Search. to find property information either by parcel, address, or owner name. Once the property/parcel is located, the “Public Record Property Information” page will be displayed. Scroll down the page and find the list of the parcel’s taxing entities. A parcel is under County jurisdiction if no taxing entities begin with the words “city of” or “town of” followed with name of an incorporated city/town. What are the Cities/Towns that are incorporated in El Paso County? Who reviews my plans and issues a building permit? Plans are reviewed by the El Paso County Planning and Community Development Department and the Pikes Peak Regional Building Department. The Planning and Community Development Department reviews it for Land Use and zoning requirements. Why do I have to pay for services provided by the Planning and Community Development Department? The El Paso County Board of County Commissioners has approved fees charged by the Planning and Community Development Department based on studies of the cost of service. These costs include, but are not limited to, staff time, equipment and technology needed to complete project reviews and other required services. 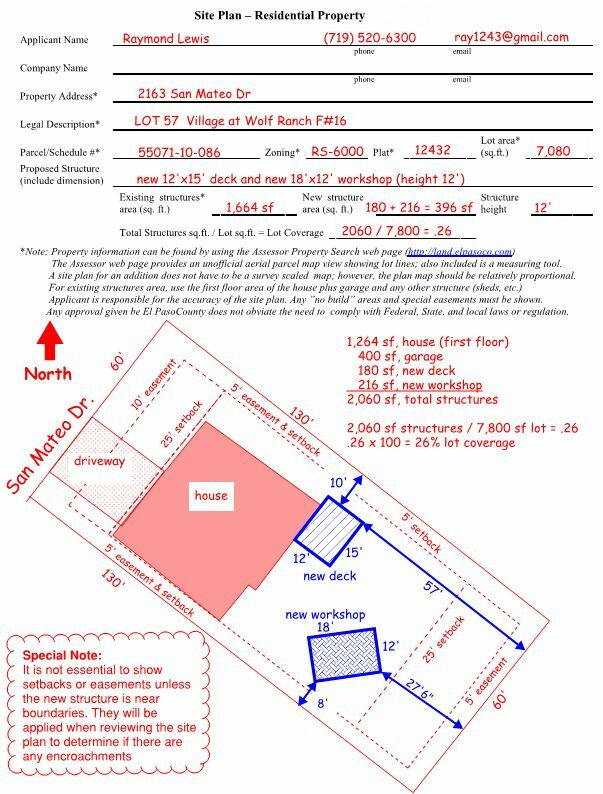 What is a Site Plan and what must it show? A Site Plan is an accurately scaled drawing of a lot or parcel showing, at a minimum, the property address, the schedule/tax number, all existing structures, easements, rights-of-way, setbacks from the property lines to the existing structures (if any), the location of the lot in relation to abutting streets, driveway/access location(s), and dimensions of the proposed structure and of existing structures, including height. If your property is a platted lot in unincorporated El Paso County, the lot dimensions on the Site Plan should match the dimensions on the subdivision plat and show any additional requirements written in the plat notes (e.g., a setback that is more than required by the County Land Development Code). Plat copies are available to view, and copies may be purchased, at the El Paso County Clerk and Recorder’s Office. 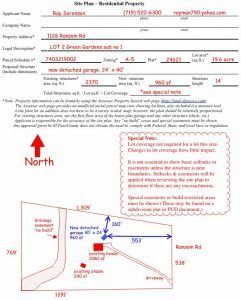 Dimensions of unplatted lots may be found in a Survey Plat, the Legal Description of your property, or at the El Paso County Assessor’s Office. A Survey Plat may be required in some cases. Professional surveyors can be found in the yellow pages of your local telephone directory. A Site Plan is needed when building a house; setting up a mobile, manufactured or modular home; remodeling an existing structure; adding a garage; building, rebuilding or adding on to a deck; and any other improvement to your property that requires a Building Permit. See link at bottom of this page for site plan form. Where can I find a Site Plan of my property? You may use a copy of your lot made from the plat of the subdivision on file at the Clerk and Recorders Office. This plat will also show the dimensions of your lot and these need to show on the site plan you present for review. The Planning and Community Development Department began real-time scanning of all documents which are reviewed over the counter in mid-2006, so any activity on your property after that date means the site plan should be in our scanned data base. If your home or other building activity on your property was conducted prior to the mid-2006 date you may be able to obtain the Site Plan from the Pikes Peak Regional Building Department. 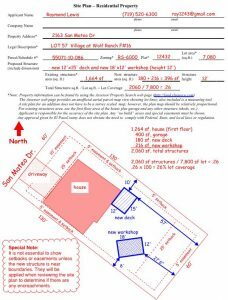 May I prepare a Site Plan myself? You may prepare a Site Plan yourself. The El Paso County Land Development Code (LDC) requires the Site Plan to be prepared in a manner consistent with regulations. Each base zoning district regulates land uses as either a principal use or an accessory use. Only one principal use is allowed per lot or parcel, except in the A-35 zoning district and in commercial and industrial zoning districts where more than one principal use may be established subject to the requirements and limitations of this Code, or where special use approval or variance of use approval has authorized additional uses. An accessory use requires that a principal use is established on the same lot or parcel as the accessory use before the accessory use is established and that the principal use continue on the lot or parcel so long as the accessory use continues, unless otherwise provided by this Code. Multiple accessory uses may be allowed on a lot or parcel subject to the requirements and limitations of this Code. The land use allowed is subject to any applicable Special Use provisions and applicable General Development Standards (Chapter 6), use and Dimensional Standards/Setbacks (Chapter 5) and other applicable provisions. This may include site plan or site development plan approval if a building or other development permit is required. The Principal Use Table 5-1 and Accessory Use Table 5-2 identifies uses which may be located on a lot or parcel within each base zoning district. Base Zoning Districts are shown on the horizontal axis with the Use Types shown on the vertical axis with the applicable Use Category being shown at the intersection. There are three use categories and are shown as: “A” – allowed use; “S” – special use; “T” – temporary use. If the use category is “blank” then the use type is not allowed for the zoning district. How to find out what zone district I am in and what I can do in that district? A Zone District is a label placed upon property to determine what development standards apply in particular areas or on a specific parcel of land. You may use the El Paso County Assessor Property Search to find which Zone District your property, or any other property in El Paso County, is zoned. To find out what is allowed in Zoning Districts, see the Land Development Code Manual and Zoning Reference Tables. May I build a second home or a home for a parent or relative on my property? Guest House – The LDC defines a Guest House as “Lodging attached to the principal dwelling or located within a garage or accessory structure which may be occupied only by occasional, non-paying guests or visitors of the family residing in the principal dwelling. A guest house is not considered a dwelling unit. Mother-in-Law Apartment – Defined as “supplemental living quarters, including a kitchen, that is attached to or part of the main dwelling unit, used exclusively by family members or an employee of a person residing in the main dwelling, and otherwise not rented or leased. A Mother-in-Law apartment is not considered a dwelling unit”. Please see Chapter 5 of the Land Development Code Manual for further explanations. What do I need to do to build a new house? Your first step is to draw, or acquire professionally drawn, “blueprints” (interior drawings of the house) and a Site Plan which will be reviewed for code compliance (land use code, universal building code, etc.) by various organizations. For construction of a new house (in addition to site plan and interior drawing review) the El Paso County Planning and Community Development Department requires that a Driveway Application and a Drainage Permit Application be approved. The Site Plan, Driveway, and Drainage applications may be submitted on-line through the Pikes Peak Regional Building Department website. The Driveway Permit will take up to three (3) days. Site Plans and Permits have fees that are to be paid at the time permits are “pulled” with Regional Building Department. If your property is considered to be in a high fire risk area, you will need to have the drawings reviewed by a Fire District/Department or the El Paso County Fire Marshall prior to submitting them to the Development Services Department for review. Some areas/subdivisions require engineered site plans. Prior to designing or submitting drawings for review, it is a good idea to call our office at (719) 520-6300 to find out if you are in such an area. May I live in an RV? You may only live in an RV on your property while building your home, with an approved Temporary Use permit. The site plan for your permanent residence must be approved and a building permit issued prior to obtaining your Temporary Use permit. It is a good idea to apply for the Temporary Use permit at the same time you bring in your site plan. I want to add on to my house, where do I start? You must have interior drawings and a site plan showing the exact location of all structures on your property, where your driveway enters the property, setback and easements shown on all sides of your property lines, and the dimension of each structure, including the New Structure you are adding to your home. There is a Site Plan Review Fee. Must my deck meet setback requirements? If it is attached to the home and over 18 inches in height, the deck must meet residential setbacks. If it is attached and less than 18 inches in height it is not considered a structure and so has no setback requirements. If the deck is detached and over 18 inches in height it is considered an accessory structure and must meet the residential setbacks or those for an accessory structure, based on the zone district. If it is detached and less than 18 inches in height the deck is not considered a structure and so has no setback requirement. How may I find the interior drawings of my house? Most interior plans are scanned by the Pikes Peak Regional Building Department (719) 327-2880. Buildings that are very old often do not have plans. I want to put a separate (detached) building on my property, what is required? Requirements for detached buildings are the same as for additions. The Land Development Code has specific requirements for size, height, and setbacks. All this information must be included on your Site Plan and must be accompanied by interior drawings. May I build an accessory structure on a contiguous parcel on which there is no structure? Yes. Both lots must be under the same ownership and an Accessory Use Agreement must be signed and recorded. There must be a principal use on the main lot. These will be tracked in the Development Services Department by creating a file containing both tax schedule numbers. The lots are considered one lot, not two. If the owner wishes to sell the parcel with the accessory use, the agreement becomes null and void and the property is in violation of the Land Development Code until a new residence is built. I want to put up a fence: what are the height requirements? Fences may be up to seven (7) feet in height. Any fence over seven (7) feet is considered a structure and must have an engineered drawing and a site plan. These must be reviewed by Planning and Community Development Department and Pikes Peak Regional Building Department. A building permit is required. If you live on a corner lot, fences must be shorter if there is a corner easement for sight visibility for the road. You may put a fence on your property line, even though property lines are frequently the middle of an easement (most easements have the same amount of property set aside on each side of a lot line). If the easement is needed, the dedicated easement user may remove or move your fence and is not required to put it back. I need to build a retaining wall. What is required? Some retaining walls require approval by the Planning and Community Development Department and the Pikes Peak Regional Building Department. Building code requires retaining walls be engineered and a permit obtained when walls are greater than four (4) feet in height. A retaining wall four (4) feet in height or greater needs Planning & Community Development Department and Pikes Peak Regional Building approval, and must meet the accessory building setbacks. If there is no special accessory building setback, then the regular setback requirements apply. Any wall that retains surcharge (pressure) requires engineering and permits, no matter what the height. A retaining wall less than four (4) feet in height needs no approvals, unless it retains surcharge. What is a setback? How may I find out what mine are? 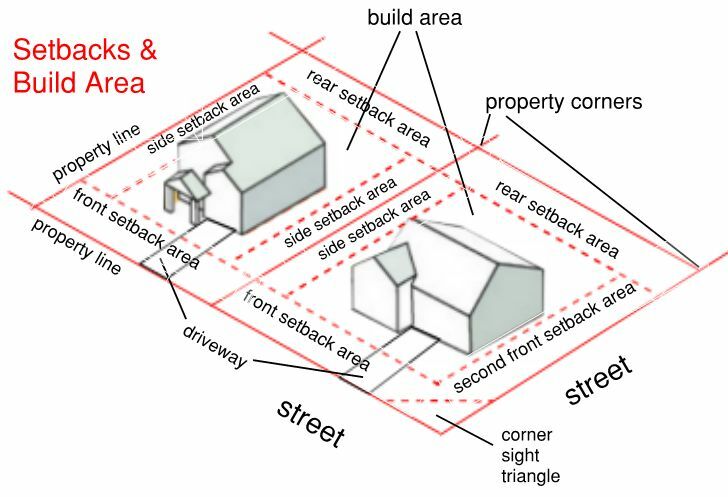 A Setback is the minimum distance from the property line to any existing or proposed structure. Setback distances required vary by Zone District and type of structure. To find which zone you are in: El Paso County Assessor Property Search. If it is attached to the home and over 18 inches in height, the deck must meet residential property setbacks. If it is attached and less than 18 inches in height, it is not considered a structure and has no setback requirement. If the deck is detached and over 18 inches in height, it is considered an accessory structure and must meet the residential setbacks or those for an accessory structure, whichever is listed in the zone district. If it is detached and less than 18 inches in height, the deck is not considered a structure and has no setback requirement. An Easement is an area which is reserved, conveyed or dedicated for a specialized or limited purpose without the transfer of fee title; e.g., public utilities easements. You continue to own the property, but it is set aside for use as needed by the entity certified (by recorded plat, etc.) to use it. You are not allowed to build a structure in an easement. Site Plans reviewed by the Development Services Department are required to show all Easements. 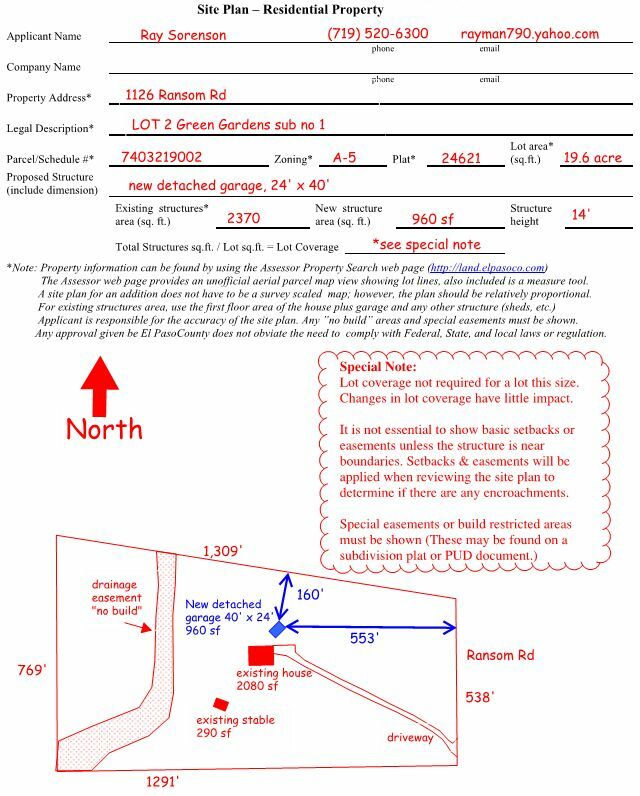 Easements are shown or specified in the notes on each individual subdivision plat. El Paso County defines a Minor Subdivision as a subdivision of four (4) or fewer lots which does not require public improvements or waivers of the subdivision regulations. What are public improvements and waivers? Public improvements include public roads, drainage structures or other infrastructure that may be dedicated to El Paso County. Waivers include any request for relief from the strict application of the El Paso County Land Development Code requirements. Is it a difficult process? Can I do it myself? The Minor Subdivision process is designed with the non-professional in mind. However, professional assistance is required for surveying and plat preparation. Most land use professionals are familiar with the El Paso County process and can provide valuable assistance to the first-timer. Surveyors, engineers and planners can be located in the yellow pages of the local telephone directory. Do I really need to subdivide? If you are creating lots of less than 35 acres in size then the lots must be created through the subdivision process. This is required by the Colorado State Statute commonly referred to as Senate Bill 35. Do I need to rezone? Zone districts assigned to a property set the minimum lots size as well as other requirements. Creating a minor subdivision may trigger the need for other actions, such as rezoning. An Early Assistance meeting is a required first step. You will fill out an Early Assistance Application and submit it with the required documents and the fee. Then a Team is assigned to your project; this team generally consists of a Project Manager, Planner and Engineer. Access to additional professional assistance is available should it be required. The Project Manager is your main contact for the project you have begun. Typically the average Minor Subdivision project takes between 90 and 120 days from submittal to the final decision. Circumstances may arise that could lengthen this process. These potential elements/specifics of your project will be determined and discussed with you at your Early Assistance Meeting. These potential elements may include subdivision regulations, zoning, comprehensive plans, access, water, sewer, drainage, wildlife, geologic factors, submittal requirements, non-county agency requirements, fees and the general feasibility of your project. After the Early Assistance meeting, you need to set up a Submittal meeting with your Project Manager. Your submittal is reviewed by the Team and non-county agencies. The project will be scheduled for the first available (agenda permitting) Planning Commission hearing after the applicant has resolved all issues and adequately addressed Development Services and review agency comments. After a recommendation is given by the Planning Commission, the project can then be scheduled with the Board of County Commissioners which makes the final decision on your subdivision request. Plats, Development Plans, and related documents are some of the items required to be recorded by the El Paso County Land Development Code. The process itself is not difficult for the applicant. Project Managers will assist you in getting your required documents signed and recorded. After necessary paperwork is checked for sufficiency by staff and the recording fees paid, then the necessary County signatures are obtained. These may include the Board of County Commissioners Chairman, Development Services Director, etc. If all the required copies of the approved plans and documents are submitted, then the process should move along smoothly. Although there is no guaranteed time frame, the documents are regularly brought to the Clerk and Recorders Office when ready. Do I get copies of the recorded documents? Yes. If it is a plat, a copy is immediately sent to you, the applicant, in the mail, or you may wish to pick them up in person at the Development Services Office. The other documents recorded along with the plat are mailed to the applicant as they become available. Does El Paso County allow Retail (a.k.a. recreational) Marijuana Sales and Growing? Does El Paso County allow Marijuana Clubs? Where can a medical marijuana business be legally located? The County strictly regulates location through the Land Development Code and medical marijuana land use can only be located in Zoning Districts C1, C2 and M. Zoning maps are available at the Planning and Community Development Department located at 2880 International Circle, Colorado Springs, 80910; (719) 520-6300. How many marijuana plants can individuals grow for themselves? What if a person is authorized an extended plant count for medical purposes? What do I do if I suspect an illegal marijuana grow? Contact the C.S.P.D. Metro Vice, Narcotics, and Intelligence Division at 719-444-3111 to report a suspected grow. For more information on marijuana licenses and information, contact the Clerk to the Board in the El Paso County Clerk and Recorders Office.